← Frequent Flyer Points Programs – Are They Worth It? Our Family Doctor, Ilana Joubert is a Mom with 3 little girls. She somehow manages Motherhood, a busy GP practice and continuing education. She finishes her latest degree in a few months and then is considering starting her own website. I take my hat off to her. Imagine if there was a way for Doctors and other Medical Professionals to work part-time. Even freelance? Well, turns out there are a few ways Medical Practitioners can freelance. Some great options in the contributed post below. One could be forgiven for thinking that the worlds of healthcare and freelancing were mutually exclusive. After all, healthcare professionals are trained and retained by hospitals, right? The only way to get ahead in the healthcare industry is to follow the tried and true career paths. You could be forgiven for thinking so… But you’d be wrong. If you’ve worked in healthcare for a while now, yet have butted your head against a glass ceiling for so long now that you could easily throw in the towel, you may have more luck bringing your talents to bear on your own terms. While freelancing in any profession carries with it an element of risk and makes job security tenuous at best, your years of experience in the industry, will give you the inside track. If you don’t want to waste all those years spent in the service of the sick and infirm, have gotten yourself some stylish scrubs from MedCoutureScrubShop.com, still have the passion and love the work but hate the career stagnation, you have every chance of finding success as a medical freelancer. Do you crave a vocation that allows you to work from home, manage your own time, work flexibly to deadlines and combine the expertise gleaned from years in the healthcare industry with a passion and talent for writing informative copy, you could make a very lucrative career for yourself as a Clinical Medical Writer. Working directly with clinical study teams on complex subjects, Clinical Medical Writers are expected to cover their specialist subjects such as oncology, clinical protocols or regulatory affairs. It goes without saying that your writing skills must be on point, and you will likely also be expected to have an advanced qualification such as a PhD PharmD, R.N or a Master’s in life sciences. If you’ve spent years working in a blood bank in a management or supervisory capacity, yet crave more independence and flexibility, you are likely tailor made to be a freelance blood bank supervisor. You will work as a contractor directly for the director of laboratory sciences. You will be expected to have at least 3 years’ experience in a similar role. Want to share your pharmacological expertise with the world, yet relish the idea of working from the comfort of your own home while wrestling back control of your work / life balance? Welcome to the life of a virtual pharmacist! You will spend your days assisting with medication cost management, handling medical compliance calls or conducting medication reviews over the phone or using a digital conferencing platform. 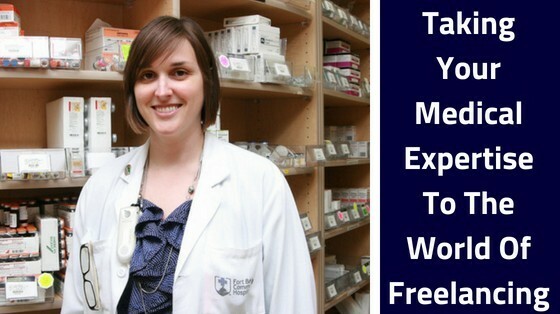 If you have a degree in pharmacy and an up to date pharmacist’s license this could be the dream career for you! Just because the life of a salaried hospital employee has lost its lustre for you, that doesn’t mean that you should stop doing what you love for the betterment of your patients! Are you are in the Medical Field or training as a Medical Professional? Ever considered Freelancing? If so, what options have you tried? Share your views and experience in the comments below. If you are a company offering some a freelancing position for Medical Experts we’d also love to hear from you.